Oxford historians now have access to Adam Matthew’s Migration to New Worlds. Following a collaboration between Jisc and Adam Matthew this resource is made freely available to all UK academics and students in higher (HE) and further (FE) education institutions from January 2016. Migration to New Worlds documents the emigration of peoples to the United States, Canada and Australasia during the period 1800 to 1924, although there are documents from the eighteenth century and also later materials. Migration to New Worlds is now available via SOLO and OxLIP+. During February, the Bodleian Libraries is inviting all members of the University of Oxford and all Bodleian cardholders to share their feedback about the Libraries by completing a short online Reader Survey. The survey only takes about 10 minutes to complete but it provides vital information that feeds into decision making and helps improve our library services. The survey is open from 8-29 February, and is for all readers who have used the physical libraries across Oxford or the online collections. In addition to members of the University, feedback is welcome from external researchers who have a Bodleian Libraries card, including alumni. Readers are asked to share their views on areas such as the provision of information resources, the libraries as a space for study, how staff treat readers, information skills and support, and their overall satisfaction with library support for research, teaching and learning. Responses are confidential. No identifying links between responses and the individual responding will be retained. As a thank you taking part, participants can choose to enter a prize draw to win one of ten £50 Amazon vouchers. The Bodleian is continually seeking feedback from readers, and conducts a readership-wide survey every 3-4 years.Numerous changes and enhancements have been made to the library service in response to feedback received from the last Reader Survey, which took place in 2012. These range from increasing library opening hours and improving the usability of SOLO (the Bodleian’s search tool) to improving the study environment in Reading Rooms and buying more e-books. Preliminary results from this year’s Reader Survey will be posted on the Bodleian Libraries’ website in April. 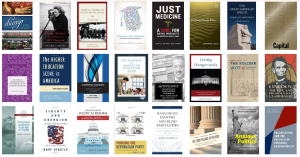 A selection of the new books received in the library during January may now be seen on our website and LibraryThing page.